Well I'm back with another story.... sorry to disappoint you all (if anybody is actually reading this). I'm going back to my roots with this one, to what truly made me fall in love with FM. That, my fellow FMers, is English LLM. This story will be based off of an e-Course I am doing here on this site, with this being more fictional-writing than what will be in the e-Course (a tutorial series). As of writing this, I am yet to do anything in the save, so we will be going in-depth from the beginning. The e-Course shall certainly be taking priority over this story but I will endeavour to deliver a high standard of story writing on a semi-frequent basis. I cannot guarantee consistency in my posting, but I can only try. Remember this guy? Yes, that's right, it is Ryan Ferguson! 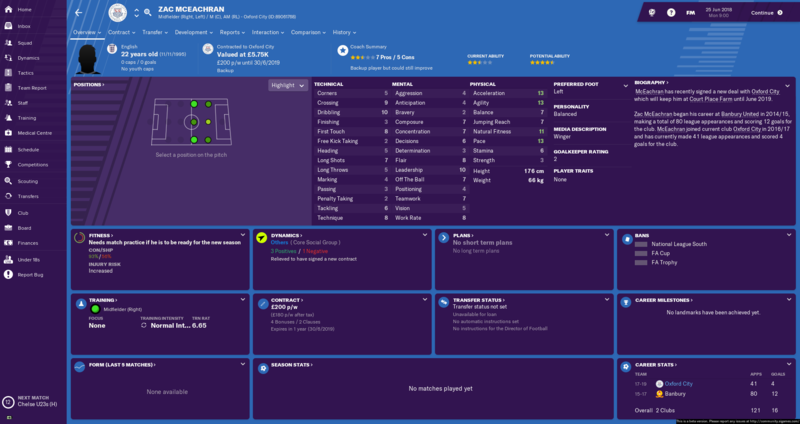 He returns for another adventure in English lower league management. The Liverpool-born former professional footballer will be trying his hand at bringing a club to the pinnacle of world football. Sir Alex Ferguson is the most notable manager of all time but Ryan is looking to usurp his namesake. That would require a significant trophy and award haul to achieve. In modern day English football that may prove to be difficult with every Premier League club now becoming a financial superpower, or nearing that status. Can Fergie become the king of football? Who Will Fergie Be Managing? 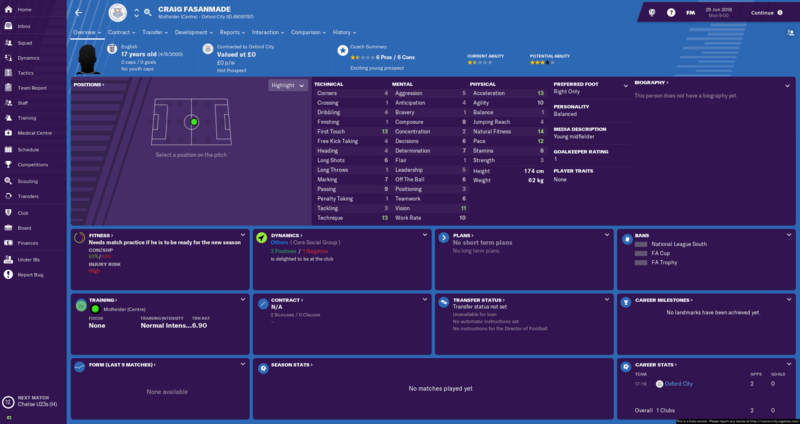 Oxford City will be Fergie's team of choice in this FM. 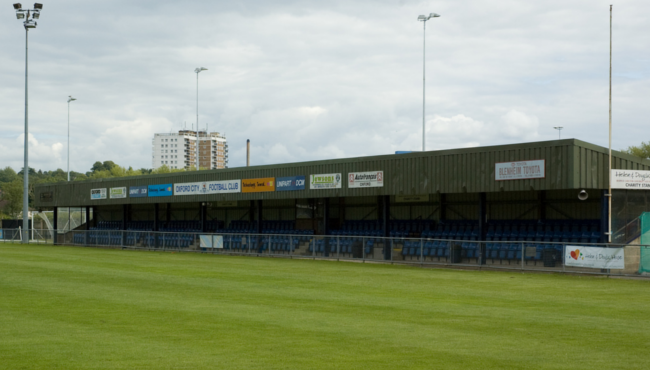 The Oxford-based club currently play their football in the National League South and are expected to struggle in the upcoming season. Our objective will be to bring the club to glory as soon as possible and to build a legacy of incredible football. This is bloody beautiful. Can't wait to see this story get started. 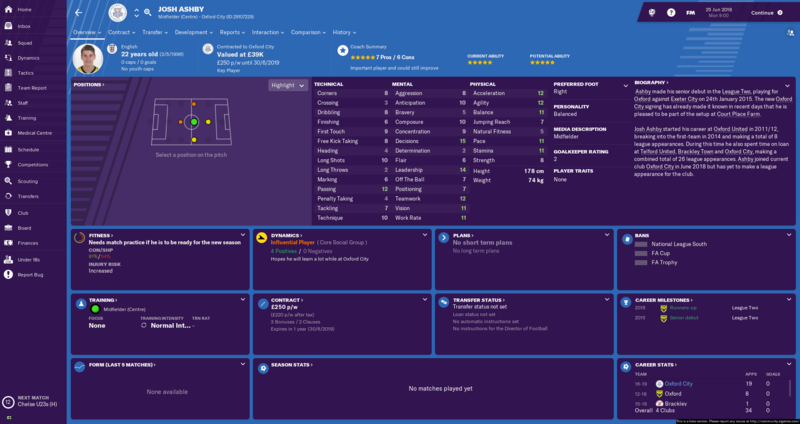 Former Liverpool player Ryan Ferguson has begun his journey as a football manager at National League South side Oxford City, signing a one year deal with the semi-professional club. The young Liverpool-born manager earned his Continental Pro License earlier this year and was seen as the ideal candidate to replace departing manager Mark Jones, who resigned from his role at Oxford City. Ryan Ferguson was once seen as a very bright prospect for his one and only club, Liverpool FC, shining in appearances at youth level for club and country. The twenty-seven year old was set to make his Liverpool, and professional football, debut in an FA Cup fixture against Reading in January 2010 but his career ended before it started as he was involved in a car crash which saw his achilles tendon ruptured severely. 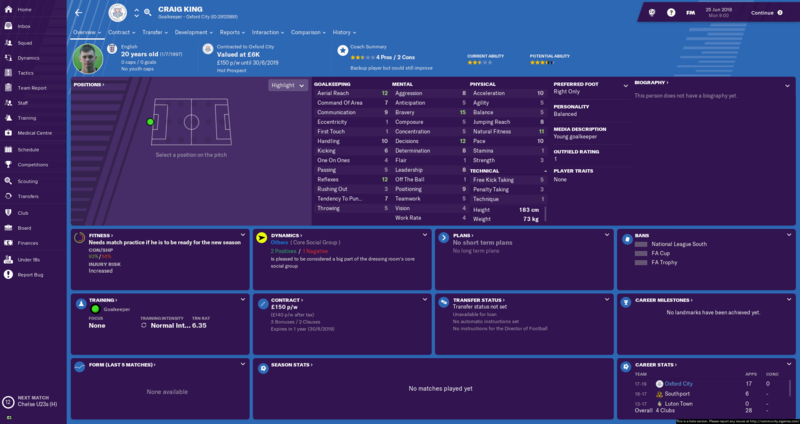 He was forced into retirement, having never played a senior competitive game. Liverpool's owners at the time, Tom Hicks and George Gillett, brought about a clause which saw them not requiring to pay medical expenses for Ryan Ferguson, leaving the then-youngster without any hope of recovery. However, John W. Henry's successful purchase of Liverpool FC also brought about a compensation program for Ferguson with John Henry paying the fees for Ferguson's rehab, as well funding coaching courses for Ryan Ferguson in order to keep him in the game. John W. Henry's contribution to Ferguson's physical recovery, as well as the funding of his coaching courses, has been well documented and has since been a successful contribution. Ryan Ferguson began earning his coaching badges in 2012 and spent time working with Liverpool FC as a junior football coach. Ferguson was part of a junior coaching team which saw the likes of Trent Alexander-Arnold, Ben Woodburn, Curtis Jones and Harry Wilson graduate to the U18s, and on to the senior team, in recent years. 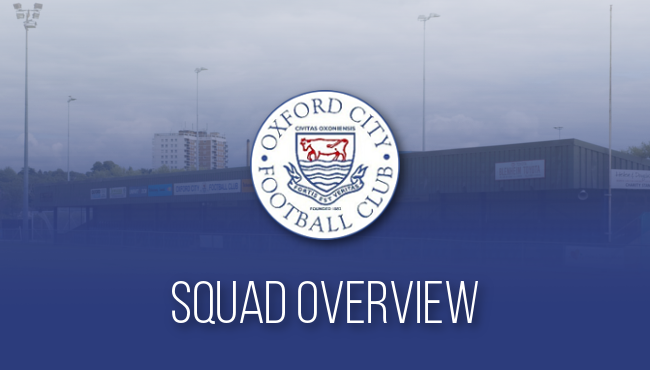 Ryan Ferguson has come in to Oxford City to replace outgoing manager Mark Jones who had been in his role as manager since December 2016, firstly as interim manager before becoming the permanent manager. 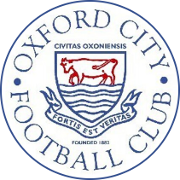 Jones had made the Oxford City chairman, Brian Cox, aware of his intention to depart several months ago, allowing the club to locate a suitable replacement in advance. Brian Cox spoke of his admiration for the outgoing Mark Jones, who had overseen some consistent seasons in the National League South, and was also full of hope for the future under Ryan Ferguson. Cox admitted that Ferguson faced a challenge, due to heavy financial restrictions, but was confident that the young manager would make a positive mark on the football club. "Today is a day of mixed emotions for the football club. We are saddened that Mark Jones has made the decision to leave his role as manager of this football club but we fully support his decision. Jones has been a terrific servant of the club and a magnificent character who has embodied the ethos and the identity of Oxford City Football Club which great professionalism and honesty. It has been an honour to work alongside him for the last number of years. In Ryan Ferguson we have a more than adept replacement. 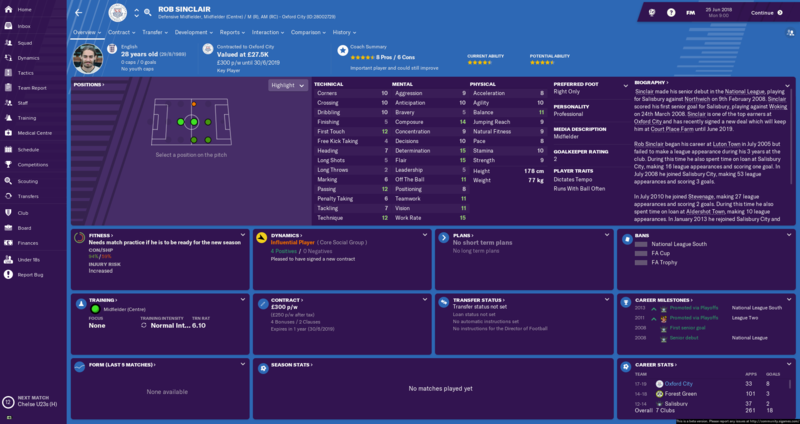 He's a young manager with fresh ideas who has experience in coaching some of the top young players in English football, at Liverpool, and has earned his Continental Pro License with aplomb in recent time. 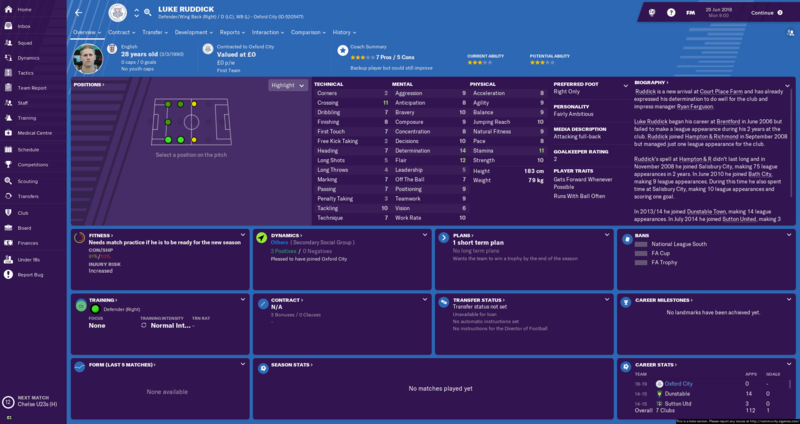 He played a part in bringing through the likes of Trent Alexander-Arnold, who had a role in our nation's run to the World Cup semi finals, as well as other bright prospects such as Ben Woodburn, Harry Wilson and Curtis Jones. His ability to develop players is a significant reason as to why we brought him in. We are a club that wishes to get the very best out of our players, both on and off the pitch, and Ferguson fits in to a category of managers and coaches who idealise the same principle. I could tell by the way he conducted himself in his interview that he is a very professional and determined individual. The reports I got from his colleagues at Liverpool FC verified that. He embodies the hard-working principles which this football club stands and lives by. He's a good lad and he'll be a good leader for his players and coaching team. We anticipate many challenges this season and unfortunately we are not in a position where we can offer Ryan (Ferguson) great financial booking, which will hopefully change in the future. I am confident, however, that we have the right man in charge and that our fortunes will change for the better under his management." "It is a proud moment for me to sit here today as the new manager of Oxford City Football Club. It is a big step for myself to be a senior manager for the first time in my career and I am buzzing with excitement at the prospect of being in the dugout this season. I am incredibly grateful to Brian Cox for giving me this opportunity and trusting me with such an important role here at this proud football club. He has shown an incredible amount of faith in me and I hope to be able to repay that faith with good performances and good results. I was fortunate enough to have played at youth level for Liverpool Football Club, my hometown side, and even more fortunate to sign a professional contract for them. Unfortunately I never got to make my senior debut for the club, and haven't kicked a ball since, but my love for the game has grown stronger since. I live and breath football. We have a small squad here and we will need to add a couple of new faces to it before the beginning of the season. We will work hard to ensure that we bring in the correct caliber of player to the club and we will ensure that every decision we make, from now on, is well thought out in advance. I look forward to stepping out on to Court Place Farm for the first time. I am proud to be manager of this great football club and I hope to make the fans proud too." 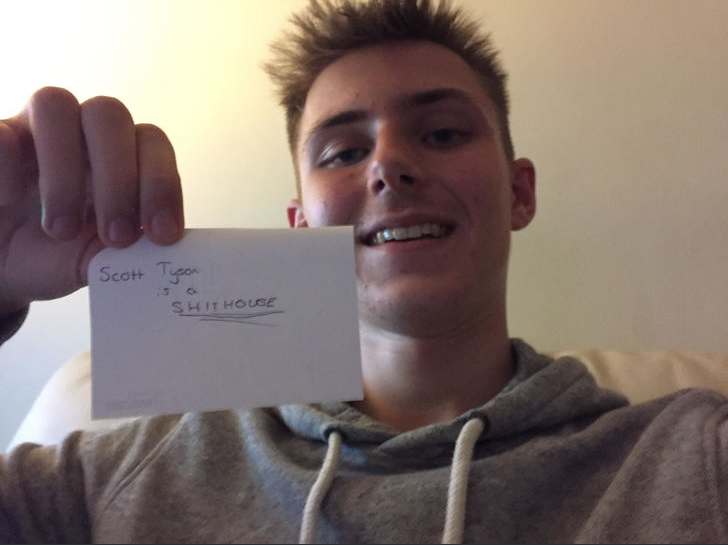 ScottT, thank you, I hope to impress you! I have high expectations of Mr Ferguson... I wonder why? Oh boy oh boy, here comes something special! ScottT, because he's a Ferguson? 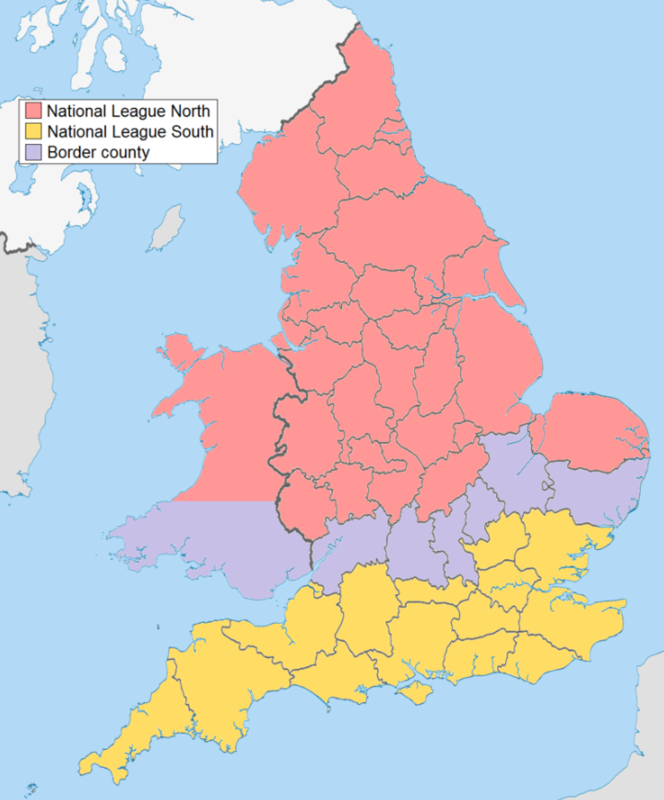 How can Oxford ever have been considered Northern enough to play in the National League North? 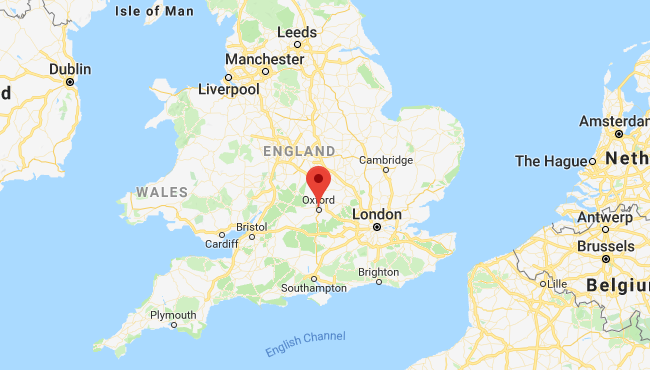 2018-10-29 22:24#251776 mgriffin2012 : How can Oxford ever have been considered Northern enough to play in the National League North? They were the most Northern team from the South, so were transferred. Lowestoft have been in that league too, as well as Brackley, Leamington and Hereford all being in the league this season. *NOTE* I'm only counting appearances/goals/etc recorded under my regime. I recognise a few names there. Tshimanga should bag a few goals for you! Reece Fleet was at Westeros as well, I swear? Thanks for the information, although knowing your managerial prowess you're not going to be at this level for very long! The mood is positive in the Oxford City Football Club camp following the appointment of highly-rated young manager Ryan Ferguson. The former Liverpool FC youth coach is thought of very highly by the club's hierarchy and brings a breath of fresh air to a club that has not excelled all too often in its 136 year history. His coaching CV includes aiding in the development of the likes of Trent Alexander-Arnold, Ben Woodburn, Harry Wilson and Rhian Brewster, four of Liverpool's brightest prospects since the days of Steven Gerrard, Michael Owen and Jamie Carragher. It's not all sunshine and rainbows at Court Place Farm, however, with the club expected to dance with potential bankruptcy in the near future. The club's chief financial analyst and accountant, David Schwimmer, has voiced his concerns over the club's future, naming the club's lack of foreseeable income as a major issue. Despite owning a stadium which can host 3,000 spectators, the club's hierarchy does not expect many more than 300 to attend home fixtures, with 100 of those being season ticket holders. With the likes of Woking, Torquay United & Billericay able to rely on attendance surpassing the 1,000 mark, the belittling figures estimated makes for grim reading for Oxford City. 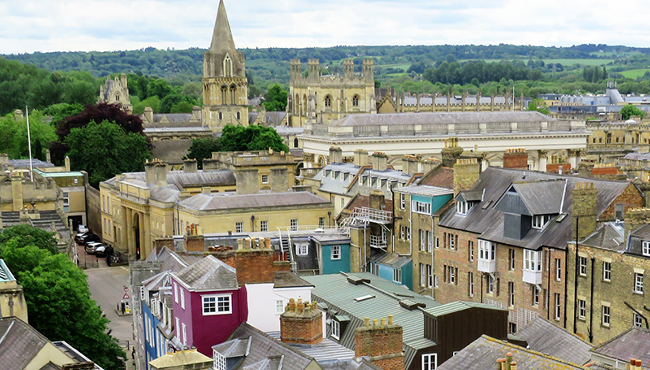 A major issue for Oxford City is the amount being spent on wages. 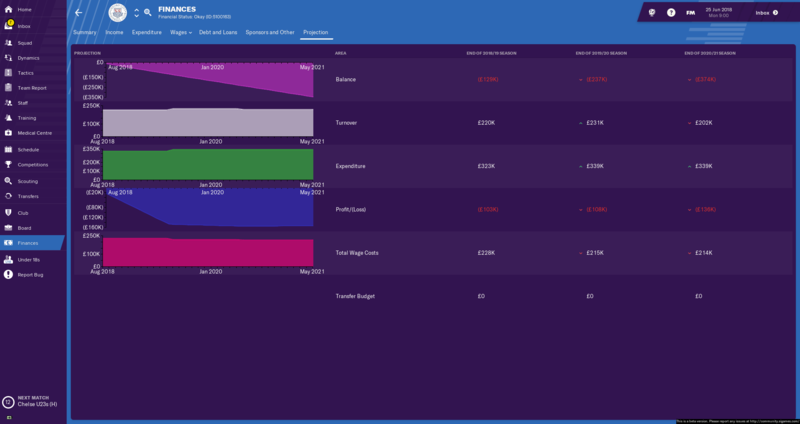 Despite spending the second least amount on wages in the entire division at an estimated £150K per year, the club does not generate enough income to justify this low spend. Oxford City fans may look on with envy at Billericay, who comfortably spend over £1.4M per annum on wages, nearly ten times that of Oxford City. The club's biggest wage eater is their new manager Ryan Ferguson. Despite never having managed at senior level, the Liverpudlian earns a staggering £900 p/w on a part-time contract. That equates to roughly £46.8K per year, which makes up almost a third of Oxford City's wage spend. To put this into contrast, Ryan Ferguson is the second highest-earning manager in the division with only Torquay United's Gary Johnson, a vastly experienced club and international manager, earning more at £1,000 p/w (£52K per year). 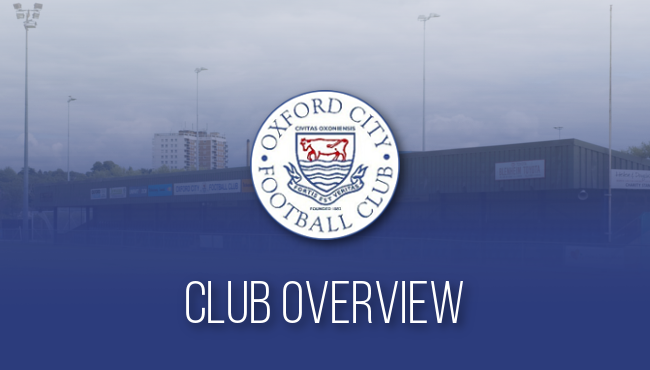 Oxford City chairman Brian Cox is not worried by the current financial situation at the club, despite his team expecting to dance with bankruptcy in the next couple of years, and is certain that focusing on bringing success to the club will help ease the financial pressure through prize money and increased attendances. Cox also showed his complete backing for new manager Ryan Ferguson and insisted that his side's new leader is more than deserving of his high wage. "We're not a strong position financially, I don't think there is any point in denying that. We are expecting to lose more than we earn in the coming years and that is a point that has to be addressed. We simply don't get enough money in to the club through attendances, sponsorship deals and other ways. For a club to operate at this level, it needs to change. I know there have been a lot of question marks over Ryan Ferguson's value to this football club. Yes, he is not experienced at senior management. Yes, he is on a very good salary. Is he worth it? Yes, I believe he is. While he doesn't have experience at managing at senior level, he's managed some of the top youngsters in this country and it takes great discipline and character to do that sometimes. It isn't always easy to coach the kids! I believe that if we can pull together and support our new man, he will lead us out of the dark and into the light. 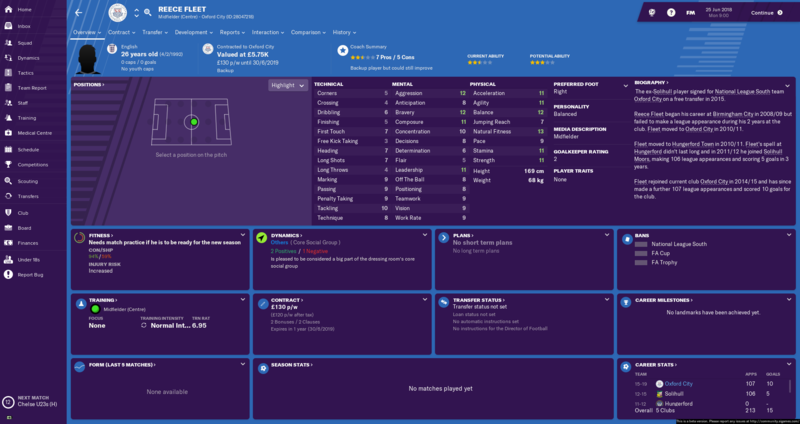 He's been at the club for less than a few hours and has already implemented a number of changes that we know will improve the club considerably. 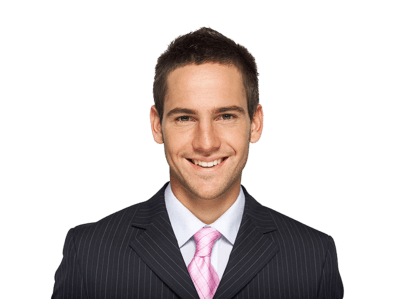 He has plenty of fresh ideas and is passionate about his work here. He's the right man for the job and we're all excited about having him here. We do need to increase our income. We're working hard to secure sponsorship deals which will see the club profit, but not lose its identity in doing so. 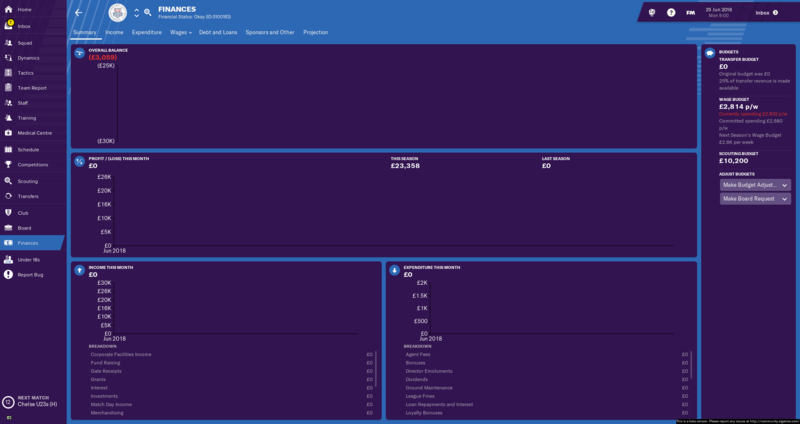 We are also working hard with the Oxford City Fan Club to find ways of increasing our attendances in games, which would generate much-needed income for the club, as well as building an atmosphere to be proud of. Ryan (Ferguson) is already working hard on making us successful on the pitch, and hopefully we can earn some income out of prize money from the cup competitions, if we prove to be successful there. We just need to come together and trust each other. We can do this." mgriffin2012, the plan is to get out of these divisions as quickly as possible! Seeing this in comparison to Billericay just highlights how ridiculous the amount they spend is. Handcrafted in Symi, Hellas. Page created in 0.271 seconds.